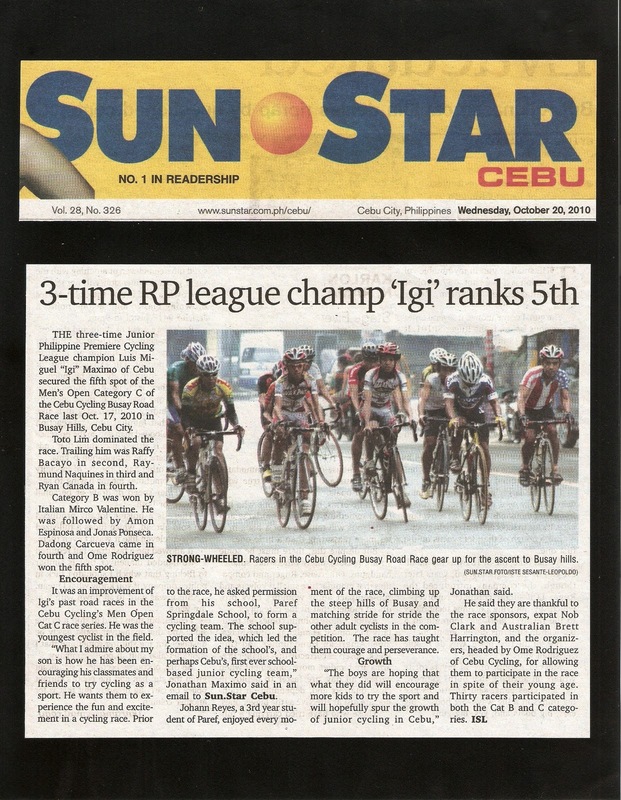 THE three-time Junior Philippine Premiere Cycling League champion Luis Miguel “Igi” Maximo of Cebu secured the fifth spot of the Men’s Open Category C of the Cebu Cycling Busay Road Race last Oct. 17, 2010 in Busay Hills, Cebu City. Toto Lim dominated the race. Trailing him was Raffy Bacayo in second, Raymund Naquines in third and Ryan Canada in fourth. Category B was won by Italian Mirco Valentine. He was followed by Amon Espinosa and Jonas Ponseca. Dadong Carcueva came in fourth and Ome Rodriguez won the fifth spot. 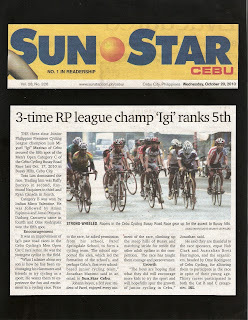 It was an improvement of Igi’s past road races in the Cebu Cycling’s Men Open Cat C race series. He was the youngest cyclist in the field. “What I admire about my son is how he has been encouraging his classmates and friends to try cycling as a sport. He wants them to experience the fun and excitement in a cycling race. Prior to the race, he asked permission from his school, Paref Springdale School, to form a cycling team. The school supported the idea, which led the formation of the school’s, and perhaps Cebu’s, first ever school-based junior cycling team,” Jonathan Maximo said in an email to Sun.Star Cebu. Johann Reyes, a 3rd year student of Paref, enjoyed every moment of the race, climbing up the steep hills of Busay and matching stride for stride the other adult cyclists in the competition. The race has taught them courage and perseverance. “The boys are hoping that what they did will encourage more kids to try the sport and will hopefully spur the growth of junior cycling in Cebu,” Jonathan said. He said they are thankful to the race sponsors, expat Nob Clark and Australian Brett Harrington, and the organizers, headed by Ome Rodriguez of Cebu Cycling, for allowing them to participate in the race in spite of their young age. Thirty racers participated in both the Cat B and C categories.